Yum, yum, yum! Can’t wait to try it. 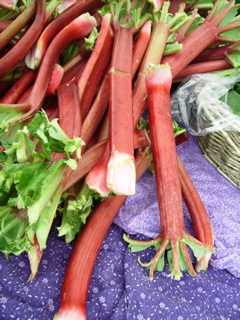 Our rhubarb is just starting and looking nice and red. Also have a bunch of yogurt I need to use up – perfect! Thanks again, Kake! 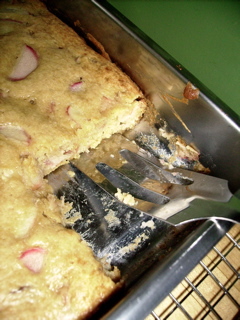 Just finished off my second warm piece of rhubarb yogurt cake. So easy to make and even my preschooler liked it. Thanks. Jane would have a delicious cheese spread. It doesn’t work for me. Any suggestions? Jane–that is one of the oddest things I’ve ever heard. I imagine its success would depend a lot on the kind of cheese, wine, ratio of the two, etc. I’m afraid I’m at a loss for this one. Maybe just enjoy the cheese at its prime and same with the wine–add some bread and call it good. Hi Katherine- This simple snack cake has become popular at Jason’s office since last spring when I made it for the first time. I am making it now (and adding some fresh raspberries because I have a few) so he can take to work tomorrow. It’s good stuff. I think about you every time I make it…thank you again for sharing. I just made this for breakfast this morning and it was DELICIOUS!!! I didn’t have whole milk yogurt but used fat free Greek yogurt instead and it worked just fine! I did sprinkle a little bit of turbinado sugar over the top before baking! I will DEFINITELY be making this one again!! I forgot to add that I added some cinnamon…. we LOVE cinnamon!! Thanks again! Thrilled that you enjoyed it Leesa. And the cinnamon addition sounds lovely. will have to try that.